Embrace this new beginning with a new outlook! Last month's chaotic energy is beginning to wind down. We are finally starting to feel a moment of ease as Earth enters into a new season. Last month had some intense energies that shook core foundations for everyone. We have been surrounded in swirling confusion and chaos for too long.. It's time to pick up the pieces, move forward and build a new foundation. This New Moon is coming at what feels like perfect timing; Sagittarius is what feels like the ideal guide as we navigate out of the murky waters. Sagittarius energy is very dominant on our planet right now. The archer is lending us a hand to pull us out of the depths of the dark Scorpio energy we have been swimming through. Much has been brought to the surface over these fall months, but it's time to move forward into the light. So grab a cup of tea, cozy up by the fire and take a look at what this New Moon energy holds for you. Today's New Moon takes place in the mutable fiery sign of Sagittarius. Sagittarius is shining a spotlight into the shadows right now. A lot was brought to the surface over these last months, and we are being asked to take a closer look and decide what it is that needs to move forward with us into this new chapter. It's time to embrace our fears and confusion, and move forward into what it is that we want for ourselves. The Archer archetype is on a quest for Truth and Faith. Let go of what it is that is holding you back from seeing the Truth, and step forward with a new sense of faith. 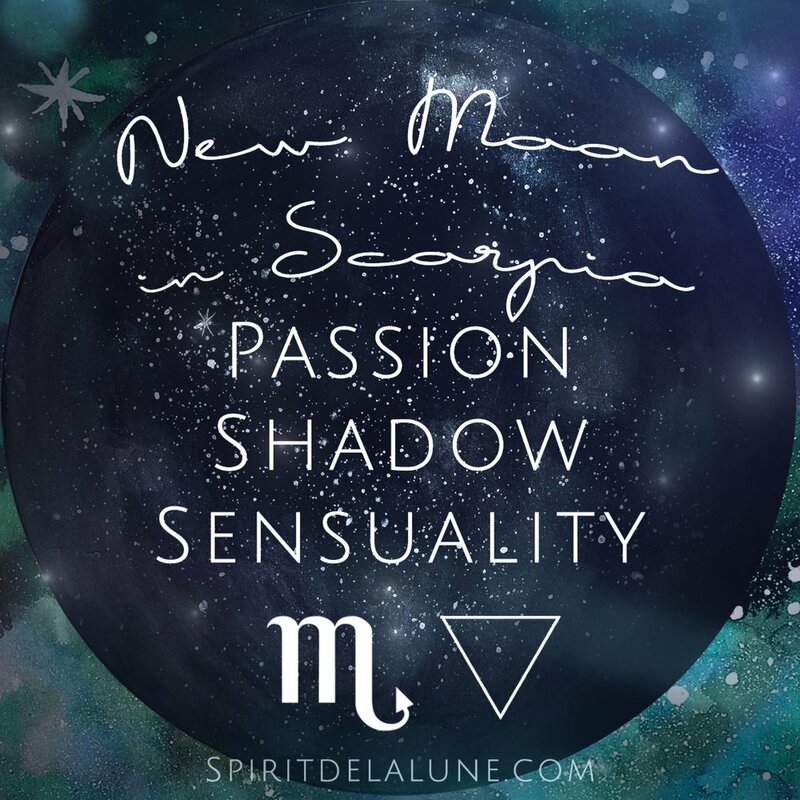 The New Moon indicates some new fresh energy coming into your life, and a brand new chapter unfolding for you. Now is the time to make up your mind, set your intentions and hold fast to your faith. Have faith, even if you don't believe fully just yet. Practice holding your faith, and allow it to become a dominant part of your life and watch your intention come to full fruition. The card pulled for this phase is the Manifest card. A reminder that our life is always unfolding, and we are always manifesting what we are matched with. You have all that is needed within you to manifest your desires.. Now is the time to focus your energy, attention and emotions on what it is that you want to manifest. Know that you are worthy of your desires and they are always within reach. Reach for the emotional manifestation first, and allow the rest to unfold into the physical. The First Quarter Moon takes place in Pisces on December 7th. As the moon grows in the sky, energy and emotion is ignited. We tend to feel impassioned and more motivated around this time. You will be finding new opportunities and avenues to help you fulfill your New Moon intentions. This moon phase is a time of growth and is ruled by the element of fire. However, this First Quarter Moon takes place in the watery sign of Pisces. You may be feeling extra sensitive at this time, especially as the moon . Your intuition may feel sharper, or you may notice more synchronicities this week. Utilize this fluid energy, and combine it with the creative fire energy of the First Quarter Moon. Go back to your New Moon intention and see what more you can do to help bring it to fruition. Make a vision board, or meditate on your intention. Use your heightened sensitivity to your advantage. The Card Pulled for this Phase is the Sage Moon Card. There may be something in your life that you need to purify yourself of. This card reflects cleansing your self; mind, body and spirit. There may be a need for physical cleansing of your space. You may be calling for a good soak in a salt bath to cleanse your energy. When working with intention and energy, it's important to keep all channels open and cleansed for energy to flow freely. What can you do to open and cleanse the channels of energy in your life? The Cold Full Moon Occurs on December 13th in the sign of Gemini. This Full Moon harks the beginning of the winter season for those in the Northern Hemisphere. Much of the earth is still and sleeping under a blanket of thick snow. We are reminded that we, too need rest and hibernation. A seed can not bloom over night, it needs to experience the depth a darkness in order to fully develop. One must experience darkness, before they will recognize the light. The Full Moon is a time of fulfillment celebration and contentment. The lunar energy is at it's peak and tonight's Full Moon takes place in the expansive sign of Gemini. The Full Cold Moon in Gemini may have you wanting to stay indoors socializing with those closest to you. Remember to stay focused this week in order to see definite and tangible results. There is a tendency of scattered energy under a Gemini Full Moon with the increase of sociability and the desire for expansion. The Card pulled for this phase is the Expansion Card. This card is quite fitting with the Gemini energy of the Full Moon. Take a look at what is growing in your life. Where is your focus? Where focus goes, energy flows, and expansion is inevitable. This energy is potent right now, and your intentions and thoughts are very powerful under this full moon. Take time to meditate under this Full Moon and focus on your Third Eye chakra to focus your vision, and create expansion. Last Quarter Moon takes place on December 20th in both Virgo and Libra.The energy begins to wind down again as we prepare for the New Moon. The days are short, and the nights are cold and long as Yule takes place on the 21st of December, marking the Winter Solstice. This lunar energy holds the same quiet air as the Cold Moon Archetype of the week before. You are asked to listen to what your body and soul needs for your own nourishment and hibernation. Take some time on Yule, the day after the First Quarter Moon, and release the old energy in your life. Make new goals and plans for the future, and set some intentions for the year ahead. Yule marks the beginning of the year and is a good time for long term goals. The Waning Moon energy can help you see clearly what it is that needs to be released. The Card Pulled for this phase is Awareness. We are being asked to be conscious and aware as much as possible. The need to be awake and attentive is now. Major spotlights are popping up all over the world, showing us what is and what isn't working. This is happening in many ways on planet earth, and within us and our personal lives. Focus and awareness seem to be major themes for this month. We are always manifesting, and our lives unfold according to our emotions and intentions. Remember your awareness and focus are your greatest tools for expansion! This week we are donating 20% of our sales to Standing Rock! We honor the courageous people fighting for Gaia and clean water. This week 20% of all sales from prints, decks and calendars will be donated to Standing Rock. Don't forget to charge your decks and crystals tonight under the New Moon, and check back here before the Full Moon, for a Full Cold Moon ceremony!